Posted on Tue, Feb 8, 2011 : 5:20 p.m.
Don’t be surprised if a surprising number of Michigan school districts fall short of proficient scoring after next year’s round of standardized state testing. The Michigan Board of Education approved higher cut scores, or scores that mark proficiency, for both the Michigan Educational Assessment Program (MEAP) and Michigan Merit Exam (MME) tests at a board meeting Tuesday. According to experts, the new standards will be more honest about how well students are doing on the tests. 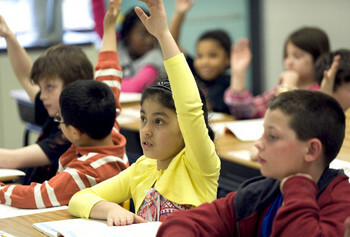 Students at Abbott Elementary School in Ann Arbor raise their hands to answer a teacher's question in preparation for the MEAP test in this 2010 photo. The higher cut scores would bring Michigan into a more comparable standing with states across the country and will improve upon college readiness, Dynarski said. The new standards will have a definite effect on the amount of students and schools able to meet proficient standards, Dynarski said. She said estimates show about 86 percent of schools in Michigan are meeting AYP standards currently, but that number would drop to about 34 percent under the new standards. Officials in Ann Arbor schools said the new standards have been anticipated and adjustments have already been made for the cut scores. Interim deputy superintendent for instructional services Lee Ann Dickinson-Kelley said the district has been anticipating the higher cut score and has a plan ready to adjust. Dickinson-Kelly said the district will enact its plan for next year and move forward based on the results. "Fortunately in Ann Arbor we have already engaged in similar conversation which is reflected prominently in our strategic planning," she said. "Once we know the cut score and subsequent impact we will work with staff to address the increased rigor and accountability." Joseph Martineau, state director of the Office of Educational Assessment and Accountability, said proficiency standards for schools will now be calculated according to the following formula: 50 percent will be based on the student scores, 25 percent on year-to-year improvement and 25 percent on how large the gap in achievement is between any two subgroups, such as between black and white students. “The benefits are that it creates a sharp focus on achievement gaps and a more simple inclusion of subgroups,” he said. State superintendent Mike Flanagan said the new standards will make districts more honest with how their students are progressing. He said he knows of districts in the state with no schools meeting the AYP standard at it is currently set, but they still have a high graduation rate. He said districts with situations such as that may graduate students but simply do not prepare them for college. Board member Nancy Danhof, R-East Lansing, said the new test standards will ultimately make students more prepared for college and will save students college tuition money by not having to take remedial classes. “From a funding standpoint, there’s an increased ability to use the funding mechanisms we have for post-secondary education by ensuring students are ready to hit the ground running,” she said. The new standards have also created a stir among some school districts who could have their accreditation affected by the new test scores. The school districts in Lansing, Kalamazoo and Ferndale joined the Middle Cities Education Association in filing suit Monday to block implementation of the new standards. They claim the standards are illegal because they are being implemented without the consent of the State Legislature, something Flanagan denied Tuesday. Ann Arbor Public Schools spokeswoman Liz Margolis said she spoke with Kelley and director of student accounting and administrative support Jane Landefeld about the new standards. Margolis said district officials expect a smaller number of students to be named proficient but a plan is in place to raise test scores over time. Kyle Feldscher covers K-12 education for AnnArbor.com. He can be reached at kylefeldscher@annarbor.com. Mon, Jun 20, 2011 : 7:47 a.m. Wed, Feb 9, 2011 : 8:22 p.m. It's easy to say that all students should be achieving at a higher standard - it is quite another to explain what will change to meet this standard. Are teachers/schools/school districts just supposed to figure it out on their own, or will there be guidance from the State B.O.E.? What else will be provided by the state for schools, teachers, communities, and parents/guardians to make sure that students reach the goals? Thu, Feb 10, 2011 : 12:48 p.m.
My point exactly. While schools will see more penalties, they certainly won't be receiving any money, supplies, or training to help with the pervasive issue of underperforming kids. Wed, Feb 9, 2011 : 2:14 p.m. If the government can impose regulations on those who accept &quot;public benefits&quot;, like welfare/ADC, unemployment compensation, Medicare, Medicaid and public housing, why can't it also impose regulations on those who accept public education? Why is public education treated differently than any other government benefit? If you want any other public benefit, there are certain standards you have to meet, and certain regulations you have to abide by. If you don't carry your end of the deal, you don't get the benefit. You want the public to pay to educate your child? Fine. You make sure the kid shows up to school every day, fed and properly dressed. You make sure the kid gets his homework done. You read with the kid and practice math a certain number of minutes/hours per week. You show up at parent-teacher conferences. You contribute to the operation of the school by volunteering a certain number of hours per school year. Your kid moves forward when s/he has mastered the material, and not simply because June arrived on the calendar or because the rest of his/her friends are moving along. There's plenty of accountability to go around when it comes to the academic performance of children in public schools. Parents may not pay tuition for public schools, but should a public education really come with absolutely no strings attached? Thu, Feb 10, 2011 : 3:22 p.m. It's a tempting idea, except for one key problem: who bears the cost of a child who is NOT educated? Not the parents. It's ALL of us. That's why we have free public education, and we require students between certain ages to attend school. It wasn't too long ago that children from impoverished families would rarely go to school but instead work in factories or mills to help support their families. That may have benefited some by providing cheap labor, but it was a net loss to society. My family cannot be prosperous and safe, no matter what we do ourselves, if we live in a society where children are not educated and growing numbers of people live in poverty and desperation. Thu, Feb 10, 2011 : 2:28 a.m.
ERMG, Go read the State Constitution carefully. The constitution requires the legislature to fund public education, and requires public school districts to operate tuition-free, discrimination-free schools, but NOWHERE in the Constitution does the State promise any child anything when it comes to education. The Constitution mandates the existence of schools. It says nothing about the right to an education. Wed, Feb 9, 2011 : 9:34 p.m. Wed, Feb 9, 2011 : 9:13 p.m.
Ypsilanti, You're the one who's not thinking about this correctly. Michigan DOES NOT provide a &quot;free education&quot; as a constitutional right. If it did, every child would be entitled to state support for education, including those who go to private schools. What you see in the constitution is the REQUIREMENT that the legislature provide for a system of *public* education. There's a world of difference between guaranteeing education as a right, and mandating the existence of a public school system. (I pay to send my children to private schools. Trust me; I'm living for the day the state legislature declares free education to be a right.) I strongly disagree with your conclusion that a &quot;free&quot; public education means that the State can not place any responsibilities on or make any requirements of the recipients. &quot;Free&quot; merely means the school district can't charge tuition. Wed, Feb 9, 2011 : 5:09 p.m.
You've got that totally wrong. A free education is a constitutional right in Michigan. See Michigan Constitution, Article VIII, section 2, which states: &quot;The legislature shall maintain and support a system of free public elementary and secondary schools as defined by law. Every school district shall provide for the education of its pupils without discrimination as to religion, creed, race, color or national origin.&quot; Because children have a constitutional right to a free education, what their parents do or don't do can't be used to deprive them of that right. If you don't like it, change the constitution. But under the law, you can't attach strings to a child's right to get the education, and you certainly can't deprive children of an education because you think their parents are irresponsible. Wed, Feb 9, 2011 : 1:45 p.m. So, while the legislature pays districts progressively less each year, increasing class size, eliminating art, music, athletics, and extra-curriculars, the children are now expected to perform better or their schools may be closed per No Child Left Behind? Who thought that was a good idea? Sounds to me like the state wants all the control, but none of the actual responsibility. Wed, Feb 9, 2011 : 1:34 p.m. Sat, Feb 12, 2011 : 7:01 p.m.
Dear Edward R Murrow's Ghost, I appreciate your statement that teacher's FACILITATE the process of learning. There are some students (too many in today's world) that will not work on anything unless I sit right there with them and walk them through each assignment. These are capable students, and in a class of 25, I don't have time to guide each student in this manner. These are the new type of students I worry about, because as you commented, I can't make kids learn. Wed, Feb 9, 2011 : 1:31 p.m. I think it is a great idea. Yes, teachers and schools need to be more accountable but Iwill tell you this parents and the students need to be more accountable. If you want someone to do it for you forget it. Students need to study. Both of my son do well in school. One has over a 4 point with all AP and Honors and accelerated classes in a very good public high school and the other one over a 3 point but only taking standard classes. No we are not rich. One studies a lot more than the other. Guess which one? The school has Christians, Jews, Moslems, Caldeans, Blacks, Chinese, Japanese students and other nationalities as well. Any guess which ones are in almost all the advanced classes? Mostly the Asian and Jewish kids because more their parents make a education a priority. And they have from the time the kids were young. Many students and school districts have gotten by with the old standards that made people think that their kids were learning and doing more than they really were. Michigan residents, wake up, the old auto jobs are gone. Our students a going to have to learn and be very educated to compete in the new economy. Wed, Feb 9, 2011 : 1:18 p.m. Wed, Feb 9, 2011 : 1:17 p.m.
Am I correct that failing the MME means a student can not graduate? Is changing the standards for this test going to mean that students who have gone all the way through school will not be able to graduate next year? Who does that serve? Also, it is great to offer college readiness curriculum and encourage students to take it. But, not everyone is going to college. It is not appropriate for everyone. There should be avenues for those people that are interested in careers that do not involve college. Sat, Feb 12, 2011 : 6:55 p.m.
Tony Livingston, in AAPS there is no curriculum for anyone except for those who are heading for college. You are right, college is not for everyone, some need to decide that they want to go, and it takes them a little longer than immediately after graduation from high school. Wed, Feb 9, 2011 : 12:58 p.m.
Mister Ed: Education reform needs to begin with the NEA. For the last quarter century the NEA has failed in teaching our youth. One look at tests scores in the US compared to other countries and it is clear the NEA has failed. We need to end the monopoly the NEA has on educating our children and the access to taxpayer money that supports the monopoly. Thu, Feb 10, 2011 : 12:43 p.m.
How do you explain that charter schools, not under the NEA, have the same scores or slightly less than public schools? Wed, Feb 9, 2011 : 12:57 p.m.
the state of michigan has been so far out of touch in education it is sick. let's change the standards every year and now raise the bar even higher. why not load the gun and lock the hammer for us too? people clammer for accountability but they cannot define it or make it reasonable. parents have no accountability and cannot even do the basic needs of children yet we expect them to all be collage bound. merit pay for teachers? it would be like telling a postal worker to deliver correctly his mail even when we remove the addresses and scramble the mailboxes every year. oh yeah DO IT BETTER, do it for less money and burger king bennies! the only person i know that believes things can and will get done better for less money and more work is our dellusional governor. Wed, Feb 9, 2011 : 12:52 p.m.
As I read the article here, as well as hearing the story on public radio, there seems to be an implication that schools and teachers don't really know how their kids are doing until the MEAP scores come out in February. &quot;Gee, we thought all our kids were doing well until we saw the scores. Maybe now we should really start teaching!&quot; If the lower scores are not accompanied by programs to help our low kids improve, nothing is going to change but the numbers. Sat, Feb 12, 2011 : 6:50 p.m.
sh1 I know what my kids are doing, without the MEAP scores. The one thing the scores tell me is that there might be an area I didn't teach well enough if many of my students couldn't reply accurately to a question on the test. But, then again, some of our curriculum does not teach what is expected on the MEAP, so go figure. Wed, Feb 9, 2011 : 11:59 a.m.
OK I stand corrected, lets just doulbe the teachers pay cause they have no control over what they do and we all know they are all teaching to their highest levels. Wed, Feb 9, 2011 : 5:21 a.m.
@ermg you are absolutely correct to point out that not every student is going to be a rocket scientist. What follows is that not every kid ina classroom, even if they had the best teacher and home environment, are going to perform at the same standard. Teachers are to worried about trying to hit a benchmark with their entire class, when they should be focusing on each childs overall development. The most important thing in life is being able to adapt to, and be invcolved in, the social dynamics of day to day living. Enhancing this skill set is not rewarded in the current formula, that is a major problem. Shouldn't it be just as rewarding for a teacher to say they kept someone out of the perhaps the criminal justice system, as it is to say you assisted a student getting into an Ivy League school? Sat, Feb 12, 2011 : 6:46 p.m.
treetowncartel, the AAPS curriculum is college driven, period. If you check the curriculum out, everything else has been taken out (what is Vocational ED.?). Every child is expected to meet the district mandated benchmarks. I have no choice in what I work with my students on, even f I see talent that might be better met by something other that a four year college. Wed, Feb 9, 2011 : 3:39 p.m. Solid point. Yes, we believe and insist that all students can learn. Yet, while for my first 30 years of teaching, we went by the premise, &quot;Take a student where s/he is and move him or her forward.&quot; Now it's, &quot;If this is a 6th grade class, teach 6th grade objectives, as that is what will be tested.&quot; We seem to be ignoring any sense of developmental readiness or individual differences. Wed, Feb 9, 2011 : 4:49 a.m.
@ cinnabar7071, could you please post the mathmatical formula that will take into account all the variables associated with those children the teachers teach that provides them merit pay? How about we let parents grade teachers, and then they get some coin returned to them based on the dysfunction they identify in those ratings. Wed, Feb 9, 2011 : 3:24 a.m.
&quot;Let me know when they tie the test scores to the teacher pay, that would be moving forward.&quot; How so? Let me know when every child that walks through the door has been fed an appropriate breakfast. Let me know when every child that walks through that door has a bed to sleep in, or a home to live in. Let me know when every parent of every child attends a twenty minute conference with the teacher. Let me know when every kid has someone reading and practicing math facts with them every night. Let me know when every parent helps their kids with homework and talks to them at dinner about what they did in school. Let me know. Sat, Feb 12, 2011 : 6:41 p.m.
eom, thanks, these are the issues we have no control over as teachers, and yet we are expected by society to solve all the gap issues. There is a new one, the kids (in lower elementary even) who are living in their video game worlds, getting through to these learners is especially challenging. Wed, Feb 9, 2011 : 1:53 a.m. I believe that the first line of this story--or at least the first seven words--may actually be a paradox. Tue, Feb 8, 2011 : 11:21 p.m.
And neither do teachers or schools. It is a shared responsibility. What I want to know is rather than who is responsible. What are we going to do to get from the 34 percent number of proficient students to something more like 80 percent? What do we need to change in the way we teach and encourage children? Do we all need Chinese mothers? This is not an easy issue to solve. But...blaming one group or another is a waste of time. Our Schools and the way they teach are broken, how do we fix it? Can we make Detroit a model of education reform and progress? Wed, Feb 9, 2011 : 2:34 a.m. Wed, Feb 9, 2011 : 12:27 a.m. I had the same question. A board member states that the new cut scores will keep college students from having to take remedial classes. I have no idea where this leap comes from. Tue, Feb 8, 2011 : 10:51 p.m. Sat, Feb 12, 2011 : 6:38 p.m. Thank you for giving the public an idea of all that we face as educators. How do I even begin to teach the student who is living in his video game worlds? Tue, Feb 8, 2011 : 10:45 p.m.
Let me know when they tie the test scores to the teacher pay, that would be moving forward. Thu, Feb 10, 2011 : 2:21 a.m.
Tue, Feb 8, 2011 : 11:22 p.m.
No problem....as along as it is also tied to parent support and participation. Teachers should get MORE pay for dealing with the unprepared, self centered students they deal with evey day...the ones whose parents think it is the teacher's responsibiltiy to teach AND parent students. Teachers can only do so much . And parents who refuse to make their children do homework, who send their children to school with out breakfast, and who openly criticize the teachers create impossible education situations. Hold them equally if not more responsible for the student's not learning. Parents beware...if teacher pay is linked to test scores, teachers will be reporting poor parenting to the Department of Social Services. Your parental failure will NOT effect my pay!! Tue, Feb 8, 2011 : 10:48 p.m.
Because teaching to a test is such an excellent measure of teaching proficiency?